If you’re looking for the world’s biggest selection of music supplies, then look no further! 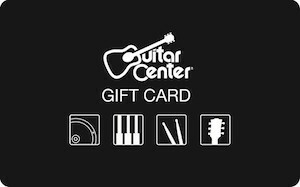 A discounted Guitar Center gift card will save you money on guitars, basses, amplifiers, keyboards, drums, percussion, DJ equipment and much, much more! Shop online or in store; the savings are just as great! With over 269 locations across the United States, this is the go-to place for all your music gear! From used equipment to premium instruments and everything in between- they carry it! And a discounted Guitar Center gift card will save you money! What’s more, you can even take lessons or attend workshops to enhance your musical aptitude! All for less money! Shop online and receive free shipping, and easy returns, as well as in-store pickup. In fact, they even offer 0% interest for 24 months, and with a Gear card, you can get the financing you need. Whether you’re looking for instruments, lessons, repairs or rentals, you will find it here! And just think of the money you’ll save when you use a discounted Guitar Center gift card! For additional savings, make sure you check for coupons so that you can take advantage of this store’s price match guarantee! Purchase your discounted card today and let your talent soar! A discounted Guitar Center gift card will save you money on your entire bill! Buy yours today and find out why since 1959, they have been a leading musical instrument retailer! Be sure to also check out our other listings for discounted cards: Google Play, iTunes, GameStop, FYE, and more! With Cards2Cash, you can save money every day of the week! Do you have a Guitar Center gift card you’re not going to use? Cards2Cash will buy it from you! We pay top dollar for many gift cards. Stop in one of our retail locations and turn that plastic into cash! Or just fill out our easy online form, and we’ll get back to you with an offer for your card. Cards2Cash is your gift card shop!